Last week during the February freeze I opened my emails and was quickly warmed and excited by what I saw. Elizabeth from 919 Marketing had contacted me with kind praise and told me that she was going to be using our blog post about the dangers of auto-posting to multiple social media platforms. I wanted to let you know how much I enjoyed your blog post about auto posting the same updates to multiple social media platforms. I thought your reasons for thinking twice before auto posting were spot on. In fact, I liked it so much that we included it in a roundup of 124 of our favorite marketing posts for our Valpak blog. Here’s a link to the roundup in case you want to check it out… 124 Not-So-Boring Marketing Ideas for Small Business from Really Smart Bloggers! So, we wanted to say thank you! Thanks for your fresh approach and for spicing up the business blogging world with some personality and creativity. Our brains appreciate it! You’re not like the average marketing blogger offering the same cookie cutter marketing advice – you’ve got a distinctive perspective. So for kicks we made a badge you can pop on your site if you want to let everyone know you’ve been featured. 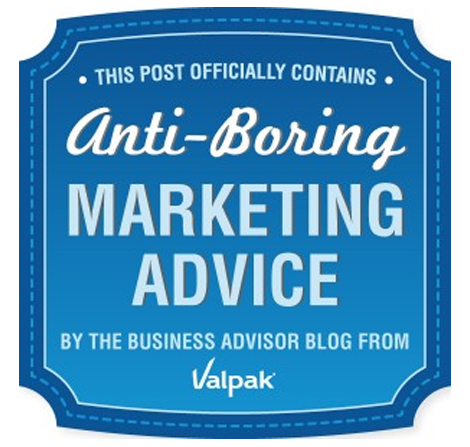 The “Anti-Boring Marketing Advice” badge is attached to this email, or you can download the HTML straight from our site, just check out the link to the post. Thanks again for the great read and I’m looking forward to reading your future posts as well!